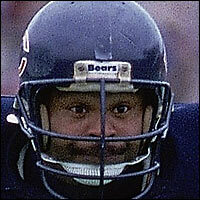 Mike Singletary could have taught violence and intimidation during his twelve year career as a perennial All- Pro middle linebacker for the Chicago Bears. But most of all he was known for his intensity and determination to beat you on every play. This entry was posted on December 27, 2010 at 9:14 am and is filed under Uncategorized. You can follow any responses to this entry through the RSS 2.0 feed. You can leave a response, or trackback from your own site.